(CNN) -- Snow flies in your face as furry friends pull you across the isolated tundra. You feel the air freeze your breath, but the cold won't stop you. You're facing Mother Nature head on -- with the help of a trusty guide, of course. Mahoosuc Guide Service's Yukon Huskies take a break from pulling the sled. Dog sledding may be less of an impossible (and far off) dream than you think. Many dog team owners in Alaska and the Canadian territories offer trips to the inexperienced public. There are even a few places in the continental United States that provide such an opportunity. CNN asked Greg Sellentin, publisher of Mushing magazine, to recommend five places to get the real dog sledding experience. Led by a team of purebred Alaskan Malamutes, Alaskan Arctic's expeditions take place in the Arctic National Wildlife Refuge. The ANWR has more than 19 million acres of pristine land. These expeditions are extremely remote -- at times 100 miles from the nearest road or village. For $385 per day per person, you will be provided with all necessary camping gear and cold-weather apparel. Trips in the ANWR are offered from February through May. From mid-November through January, Alaskan Arctic Expeditions also offers overnight or multi-day trips out of Fairbanks, Alaska, that run $250 per day per person (two-person minimum for all trips). 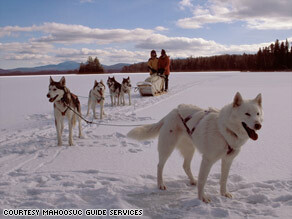 Mahoosuc Guide Service offers day, overnight, 3-day weekend and 4 to 6 day sled dog excursions. Day groups travel on gentle trails near Grafton Notch State Park and tuck into a campfire-cooked lunch. "For those contemplating trying dog sledding on their own, we offer instruction in training, handling, and the opportunity for you to drive one of our well behaved dog teams," Mahoosuc's Web site states. Overnight and longer travelers are provided with all necessary clothing and equipment. Opportunities for skiing and snowshoeing are also available, for participants in good shape. Two-day trips are $555; three-day trips are $630. Children under 13 get a 25 percent discount. At Mahoosuc, you will travel with celebrities: The dogs at Mahoosuc Guide Service have starred in several movies, including "Never Cry Wolf." Dan Seavey co-founded the Iditarod Trail Sled Dog Race in 1973. Since then, his family has bred five Iditarod racers and 100 champion sled dogs. Seavey's offers summer and winter tours in Sterling, Alaska, and summer tours in Seward, Alaska. In the summer, your adventure begins with a two-mile dog sled ride in a wheeled sled. Once finished, visitors can tour the kennel, dress up like a musher and "cuddle adorable husky puppies," Seavey's Web site states. The winter tours travel the Kenai Peninsula. Prices for summer tours are $59 for adults, $29 for children. Winter tours are $99 for adults, $69 for children. Full day packages that include a tour of Seward and Exit Glacier are also available for $129 for adults, $79 for children. For those looking for a longer trip, Uncommon Journeys is your destination. Owners Rod and Martha Taylor have been leading people into the wilderness for more than 20 years. They offer seven-day and two-week expeditions that run from $3,500 to $10,000. Many people start their journey at the Uncommon Homestead, which has a sundeck, hot tub, library, greenhouse, recreation room and dining area. "You could conceivably mush a dog team 150 miles to the Pacific Ocean from our front yard and not see another soul on the entire trip!" the Uncommon Web site states. Snowy Owl Dog Sled Tours offers trips anywhere from two hours for $137 per person to two days, including an overnight for $1,200 per person. The Powder Hound Express is designed for visitors on a tight schedule. It includes a 30-minute orientation and a one-hour backcountry ride. If you're comfortable, you can drive your own dog sled team. The Sunfeather Winterlude runs four hours and includes a campfire lunch. Or you can try the Snowy Mountain Winter Village that offers two hours of dog sledding and a bunch of activities like snow shoeing and tobogganing. Of course the overnight guests need lodging, which is why Snowy Owl owns a heated Sioux Indian Tipi.